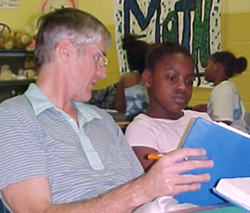 The Rotary Tutoring Hour project allows children who otherwise would be unable to afford tutoring services to receive educational enrichment from trained professionals. Rotarians provide assistance in remedial reading as needed on Tuesday afternoons. Typically, the volunteers work with two or three students to help reading comprehension, word recognition, pronunciation, and other literacy needs. The ultimate goal of the program is to help students improve in school with our concentration being reading. The club's involvement combines financial support from Auburn Rotarians, as well as Rotary District 6880 and Rotary International.